Tested a microSD card in your isostick? Great! Please edit the table below if it worked / didn't work. While we don't expect any compatibility issues with microSD cards, this list is so people can buy and be relatively sure everything will work just fine. Note: You'll need to create and account and confirm your email address to be able to edit this (and any other) page. If you don't know what to put in a particular column, you can leave it blank. Don't remove old data - admins will curate it when the data is no longer needed. If you have a card that doesn't work, and are willing to potentially help debug an issue, post a link to a way to contact you in the owners column. Don't post your email address directly, though, unless you love spam from everyone on the internet. 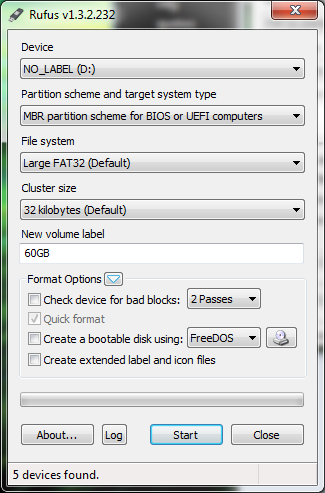 64GB cards require FAT32 formatting, which Windows' formatting utility will not do by itself. Rufus is recommended with these settings. Some research into microSD card speed from the Kickstarter. Note that isostick itself is limited to 12MiB/s transfer rate, regardless of the card used. Have any questions? Post to the talk page or the forums, and someone will take a look and try to help you out. PNY 32GB 10 P-SDU32G10-GE 1617 Working Barely meets Class 10 speeds. This page was last modified on 22 March 2016, at 00:26. This page has been accessed 54,042 times.